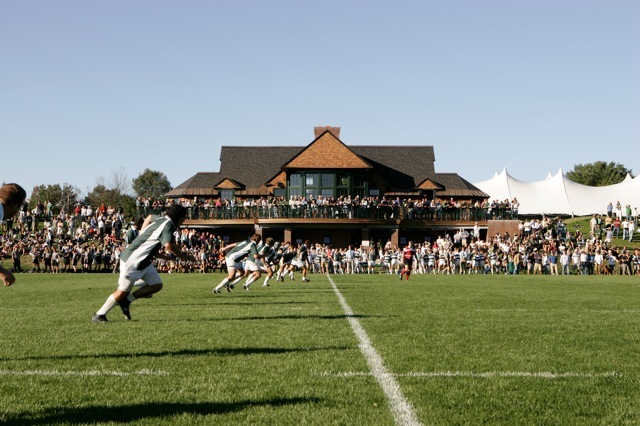 Hanover, NH – In the last chance to iron out the kinks before the Ivy season starting next week, Dartmouth met with Varsity Cup rivals, Navy, for a final preseason friendly match up. The Big Green last met with Navy in the spring season when they lost 23-22 in the tightest of games in the first round of the Varsity Cup. The meet this time was a very physical one, much like the Big Greens past two games, with the visitors winning the game 55 – 29. The first seven points of the game came in the seventh minute when a counter attack off a deep Navy kick landed in the hands of Dawit Workie ’17 who in turn hoofed the ball back down the side of the field, releasing John Abraham ’16 to complete the chase. Given the awkward bounce of the ball, Abraham opted to dribble the ball down the field and into the try zone with his feet before launching on the ball to earn the first points of the game. Navy fought back, and before long they had secured the lead and added to the point’s differential. Before the close of the first half, Curtis Oberg ’16 scored a sensational intercept try after running a good 60 meters. After an inspiring chat with Coach Hickie in the locker room at half time, the Big Green came out raring to go. Max Parker ’17 quickly opened the scoring after he collected a beautiful cross kick from Workie in the try zone. Parker then proceeded to add to his tally after collecting loose ball after a breakdown on the wing before running powerfully into the corner to score the points. The Big Green travels to Cornell next week (Saturday 3rd October) for their opening game of the Ivy season. The team will be looking to make an emphatic statement towards retaining the Ivy trophy with a strong win off of the back of three tough preseason games.